Outdoor movie theatre is rapidly becoming a new must-have feature for holiday parks, together with heated pool and jumping pillows. It brings new experience to the guests, giving them the entertainment they do not have at home. Open air cinema occupies park visitors at night, when other activities are not available. It takes 15 minutes to set up the movie theatre. Ask your guests to bring their sleeping bags, chairs, and pillows and let the magic begin. With so many ways to entertain, the outdoor movie theatre is bond to become a key feature of your Holiday Park. All you need is to plan different activities to involve the guests of all ages. To select the screen of the right size, take into account two factors: the size of the audience and the space available. 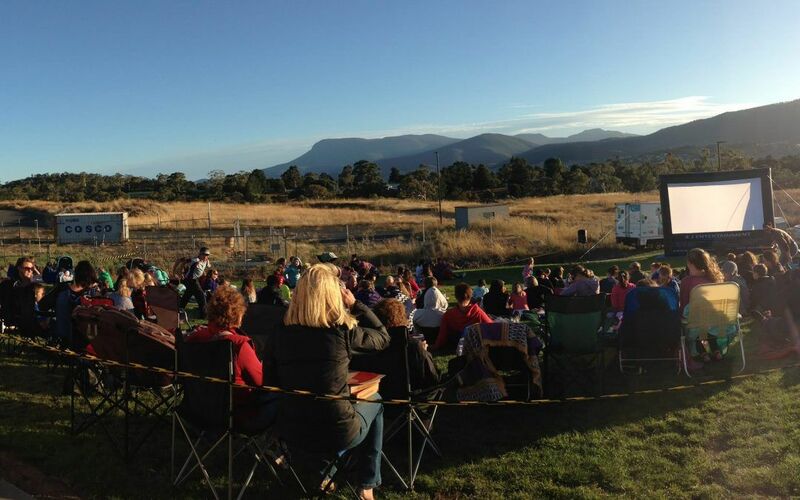 For a caravan park up to 1000 patrons, you can expect 200-300 movie-goers. For the audience of this size, we recommend a four metre screen. 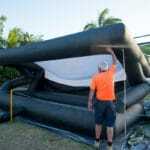 However, if you plan to place the cinema screen near the pool, you may have to choose a three metre system. On the other hand, small screen can look a bit lost in a vast area. If your backdrop is an endless field, go for a five metre screen. Showing movies requires licensing. 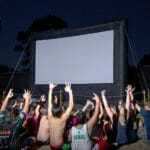 However, owners of caravan parks can screen outdoor movies with a Blanket Licence. A Blanket Licence allows holders to screen films to their audience all year round for one low annual fee. 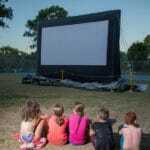 Outdoor movies bring more fun and more entertainment to the visitors of holiday parks. 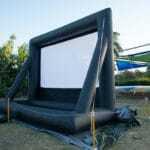 Make sure your business is ready to share the magic of open air cinema with your guests.